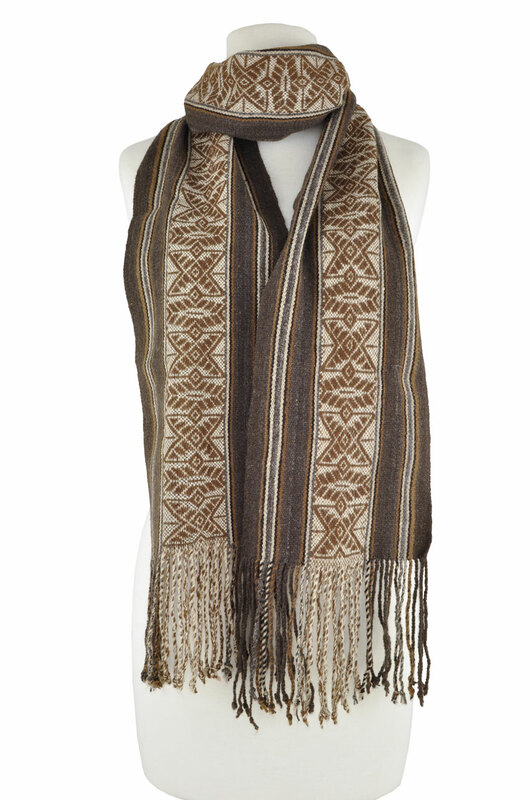 Knitted chullos from Pitumarca are knitted of alpaca, 12 stitches per inch, with colorful patterns and stripe-and-check border similar to Chinchero. 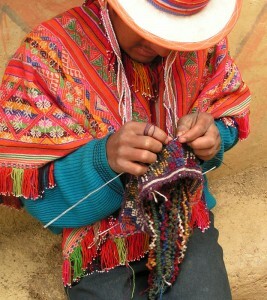 Yasmina Panihuara of Chinchero knits a traditional-style chullo. The cola (tail) is being formed. 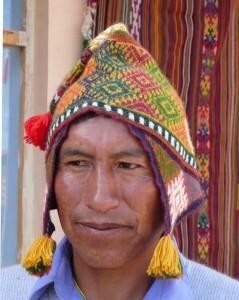 Notice the scallop, stripe, and check border on this Chinchero-style knitted hat. After the edging, the straight edge of the hat begins with a stripe and check border design called ñaccha (comb) or k’utu (bump). Next step is the head shaping, ridden with designs influenced from animals (such as fox, goose, hummingbird, and pigeon) and agricultural references (furrows, plants, ropes, etc.) Then the cola or tail, the narrow part of the chullo where animals are knit upside-down, is knit. The top of the hat is knit into three tubular sections, ending in three tassels. Fringe is added to the tail as well and narrow woven bands are sewn on the base to tie the hat to the head. The very last step is knitting the orejas, the ear flaps. Chullos are worn by men and boys as well as babies, and frequently worn perched on top of the head versus pulled snugly around the ears. Ear flaps or woven bands with beads may be attached at both sides of the hat. 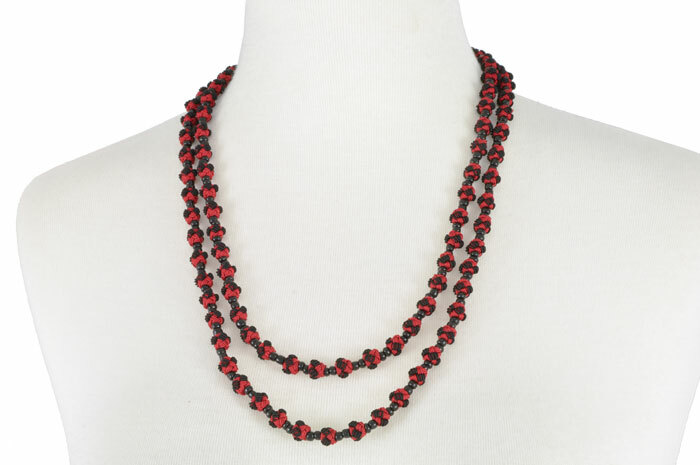 Beads may also be incorporated as decorative elements. Men knit their own chullos in the Chahuaytire community. Knitted earflaps are added as are buttons and woven braids for further adornment. 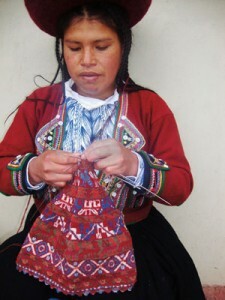 Men predominately design and knit the chullos in Chahuaytire. 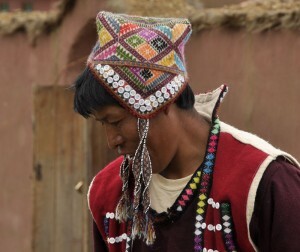 In Accha Alta, both men and women knit the “bobble” style hat—the grutas, strings of lumps or bobbles, are made separately and then knitted into the hat to create geometric patterns. 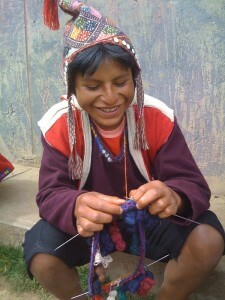 Young male from Chahuaytire community knitting chullo (hat). The bobble-style hat being knit by a man in Accha Alta. Patterns aren’t recorded but passed down or shared within a family or community. Graphs may be created but many times designs are created as they knit. 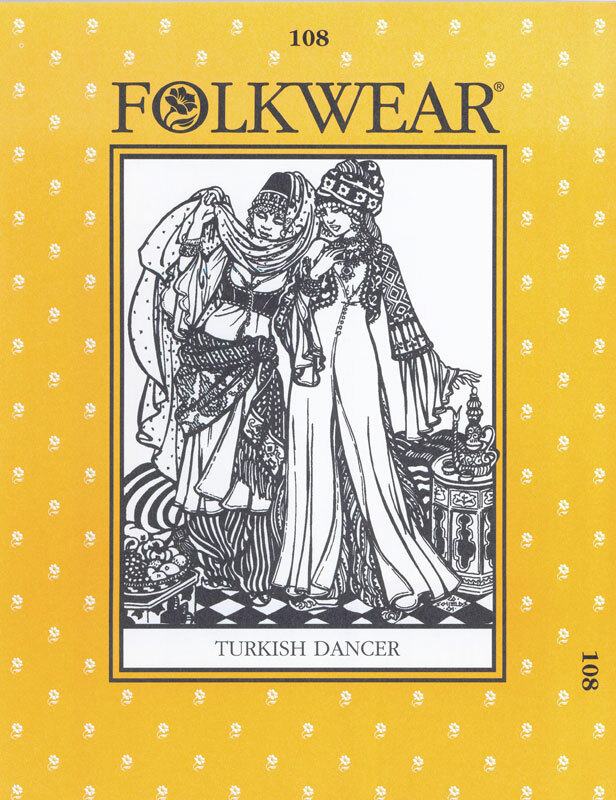 Motif patterns and colors signify regional identity and sometimes marital status. For us, especially in the cold weather, we don these knitted jewels to wear as crowns upon our heads. 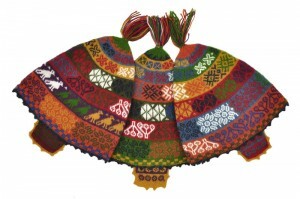 Sallac-style design of man’s knitted hat (chullo) with knitted earflaps and tassels. 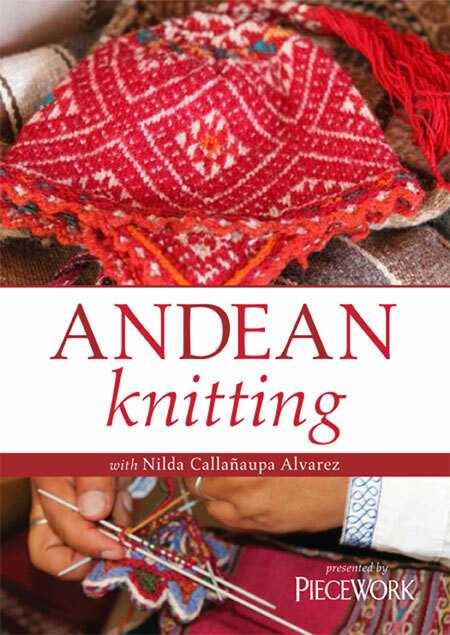 —-Nilda Callañaupa learned her knitting and so much more from her Elders. She is the founder and director of the Center for Traditional Textiles of Cusco. She is co-curator the exhibit Weaving Lives: Transforming Textile Traditions in the Peruvian Highlands opening this Thursday at the Avenir Museum of Colorado State University. The show runs through August 2, 2013. 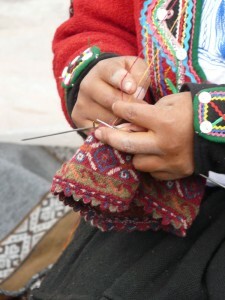 Nilda is teaching a workshop this Saturday on the Chinchero style of chullo knitting. And if you can’t knit one you can buy a handknitted peruvian hat from CTTC at ClothRoads.